Analysis of medical care and optimazation for patients with acute urinary retention admitted to hospital in Moscow Pushkar' D.Yu., Malhasyan V.A., Hodyreva L.A., Rasner P.I., Kupriyanov Yu.A., Dudareva A.A., Semenyakin I.V., Engay V.A., Zingerenko M.B., Zinuhov A.F., Mamaev I.E., Otvetchikov I.N., Red'kovich V.I., Suleymanov S.I., Tahirzade T.B., Tedeev V.V., Trushkin R.N., Cyganov S.V., Motin P.I., Lasskiy I.A. The effectiveness of free and cell forms of aminoglycosides fluoroquinolones in experimental pyelonephritis Siplivyy G.V., Siplivaya L.E., Kukureka A.V. Prognostic value of true castration levels of testosterone in patients with hormone-sensitive prostate cancer Grickevich A.A., Mishugin S.V., Kazanceva M.V., Teplov A.A., Medvedev V.L., Rusakov I.G. 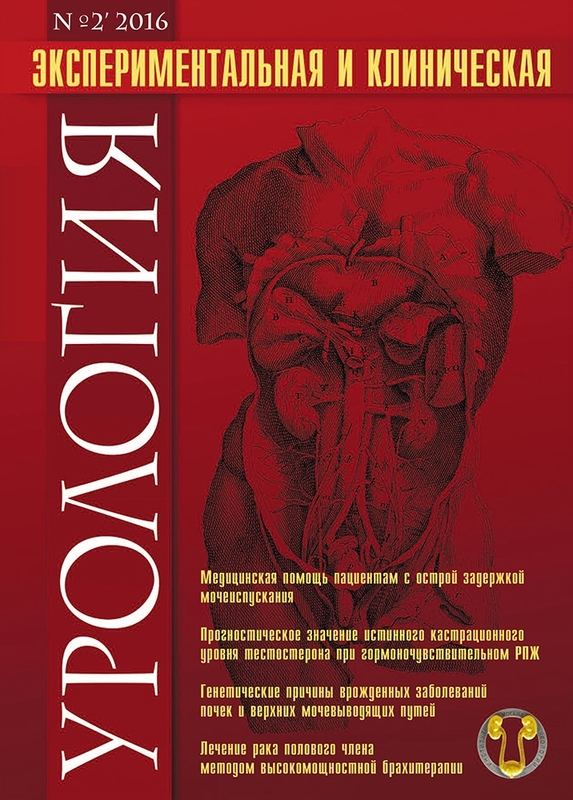 Laparoscopic transmesenteric partial nephrectomy Kochkin A.D., Sevryukov F.A., Martov A.G., Knutov A.V., Semenychev D.V., Sergeev V.P., Novikov A.B., Orlov I.N. A clinical case of a penile cancer therapy by method of high doses brachytherapy (HDB) Gavrilova M.A., Sadykova E.V., Logvinenko A.V., Capenkov N.A., Znobischev V.G., Lykov A.V., Kel'n A.A., Oschepkov V.N. Clinical economic justification of a strategy of determination of PCA3 in urine for diagnosis of prostate cancer Sivkov A.V., Kaprin A.D., Efremov G.D., Mihaylenko D.S., Grigor'eva M.V. Тhe application of hemostatic matrix with tubeless execution percutaneus nephrolithotripsy Merinov D.S., Gurbanov Sh.Sh., Arustamov L.D., Artemov A.V., Epishov V.A. Complications of laparoscopic pyeloplasty on Clavien classification Guliev B.G., Aliev R.V. Cost-effectiveness analysis of different methods of endoscopic treatment for patients with unextended ureteral strictures Popov S.V., Skryabin O.N., Orlov I.N., Chernysheva D.Yu. Percutaneous nephrolitholapaxy: past, present, future… Rogachikov V.V., Nesterov S.N., Il'chenko D.N., Tevlin K.P., Kudryashov A.V. Influence of regulatory peptides on the mobility of human sperm cells in vitro Evdokimov V.V., Zaharikov S.V., Andreeva L.A., Myasoedov N.F., Turoveckiy V.B. Clinical aspects of vascular anatomy in patients with varicocele (lecture) Kapto A.A.
Urethral stricture: modern state of the problem. Literature review Sinel'nikov L.M., Protoschak V.V., Shestaev A.Yu., Karpuschenko E.G., Yancev A.A. The state of sexual function in patients with neurogenic overactive bladder before and after treatment with botulinum toxin type A Sivkov A.V., Romih V.V., Zaharchenko A.V., Panteleev V.V., Arhireev A.S., Panteleeva M.V., Romih F.D. Improving means of hygiene and rehabilitation. Innovative feminine pads containing probiotic cultures Romih V.V., Borisenko L.Yu., Romih F.D. Acute purulent iliopsoitis and its differences from the acute paranephritis Davidov M.I., Tokarev M.V. Fournier’s gangrene: modern approaches to treatment (literature review) Prohorov A.V. Genetic causes of congenital diseases of the upper urinary tract. Literature review Garmanova T.N.